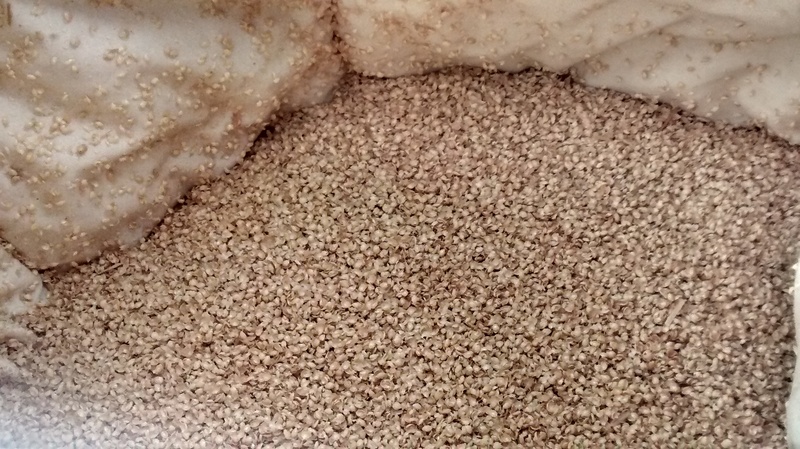 Millet hulls are the shell of the edible seed. Ours are grown from organic millet fields in Colorado. The hulls are hypo-allergenic, are not habitable to dust mites, are cool to sleep on and are supportive and durable. 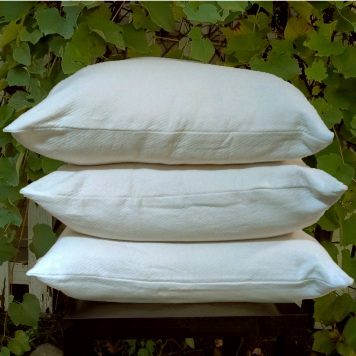 This pillow kit is sold with a quilted wool case to provide a cushion atop of the millet. The case can be gently hand washed (see Care tab). 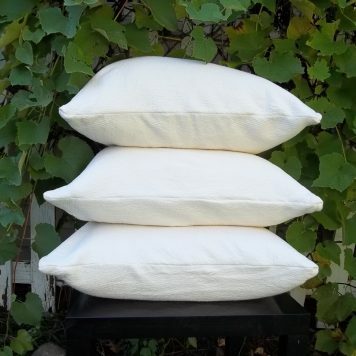 For those of you who like wool’s natural abilities to repel dust mites, you can know your millet pillow is keeping you comfortable and bite free. 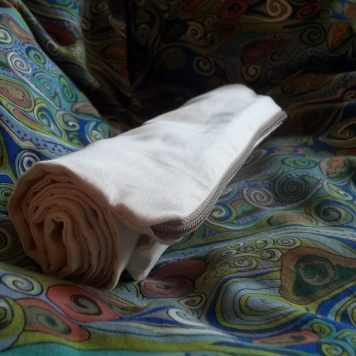 We do not include a liner with this pillow as the liner inhibits the free flowing movement of the hulls. 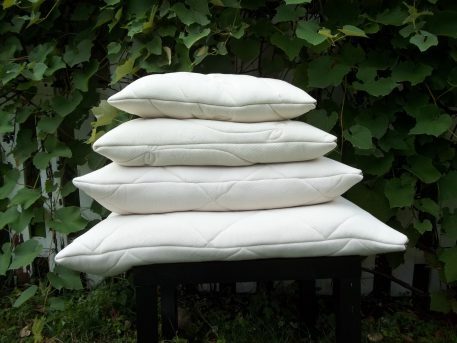 This quilted pillowcase uses our wool from local farms sandwiched between two layers of GOTS organic cotton fabric. 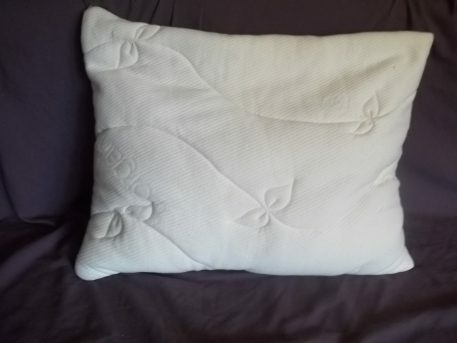 They are quilted by a local long arm quilter. The feel is almost exactly the same as our Quilted Ticking. The outer fabric is our smooth, soft double knit and the inner our sateen. One short side has a full length zipper. To eliminate the chance of the zipper coming open on its own and to silence the jingle of the zipper pull, we have hidden the pull inside a pocket to keep it secure. This kit is not the same price as selecting the purchasing the same products separately. It is discounted here to account for its combined components. To buy more loose fill or to choose the standard inner or outer pillow cases, see our Pillow Parts page. This kit does not come assembled. To let you participate in the DIY aspect and to let you choose your amount of fill inside the case, we let you stuff the pillow yourself. 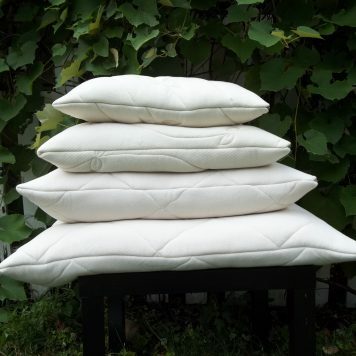 Should your Quilted Pillow Case become soiled and need to be washed, you may HAND WASH it, just like our other wool products. Vinegar or hydrogen peroxide may also be used for sanitizing or spot cleaning. These instructions are not difficult, but should be read to avoid shrinking your ticking. 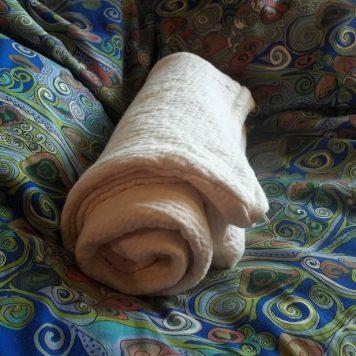 Shrinking is caused in part by the rubbing of the wool fibers against each other. As the fibers are rubbed against each other, they intertwine, shortening their length. Avoid over agitating the wool by scrubbing. 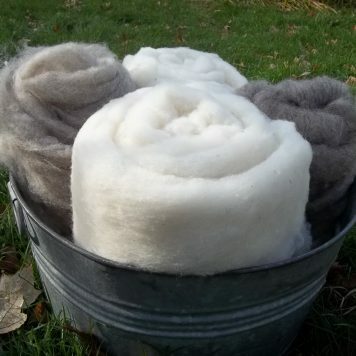 Strong soaps will raise the PH of the wool and cause it to felt. Drastic heat changes in the water will also cause the wool to felt. Let your ticking felt float, submerged in a tub, such as your bathtub, full of tepid water. Drain water and gently squeeze out water. Drain water and press out the extra water in the ticking. You may use the centrifugal force of the spin cycle in your washing machine to wring extra water out. 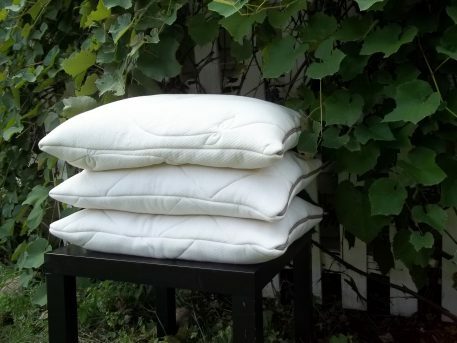 After it has dried for a day or so, you should have a fresh smelling Quilted Pillow Case ready to use.